GALION — As the start date of the 2018-2019 school year approaches for many area schools, students at Galion Middle School will walk in to see new art work lining the halls and gym wall courtesy of local artists and alumni. Galion Middle School math teacher Rachel Gangwer is responsible for the project as a part of her staff involvement with the Lighthouse Team. The idea was originated by another teacher who is taking time off for maternity leave, and Rachel didn’t want to see the project stall. “I was involved with another Lighthouse Action Committee, but we had enough staff there that I could step in to the other role and cover while she was taking necessary time off,” said Gangwer. The idea to do murals had been suggested prior to Gangwer getting involved, and funding for the projects came from the Lighthouse Team. That is where Galion native and artist Meg Frazier came into the project. Frazier was completely open to doing whatever design idea the committee wanted, but ultimately they decided to incorporate the tiger eyes design that is currently on the floor at the high school gymnasium. “We met as a group and looked around the gym to decide on the best placement for the mural, and based upon that, the tiger eyes was a perfect fit,” Frazier said. Frazier completed the mural in an astounding two day time period last weekend while she was back in town between art shows and other commitments out of state. Frazier’s gym mural is not the only addition to the walls of GMS for the coming school year. Amanda Wiggins, owner of The Topia Boutique in uptown Galion, is currently at work on another mural in the main hallway beside the library, and another small mural is planned near the school office that will feature a ‘Staff Spotlight’. Last school year, Galion grads Dustin Foust and physical education teacher Matt Tyrrell painted a mural in the gym of the Primary Elementary School building that was a highlight for students as they began the school year. Certainly, these new additions at the middle school will be no different. 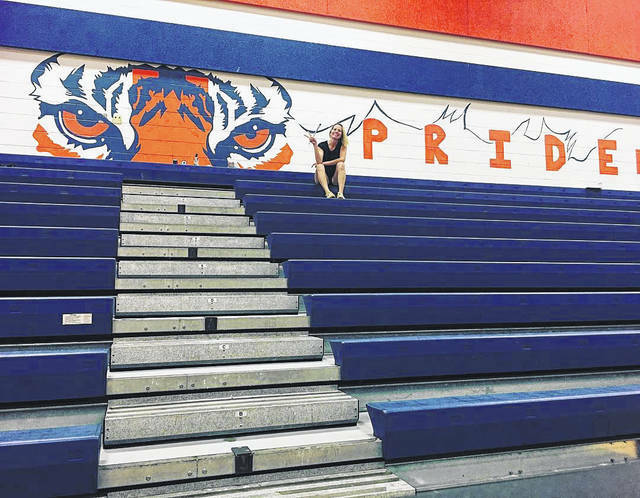 Erin Miller | Galion Inquirer Galion grad and artist Meg Frazier sits atop the bleachers in the gymnasium at Galion Middle School next to the mural she painted last weekend. Another mural is currently underway by Amanda Wiggins with funding for both projects provided by the Lighthouse Team. https://www.galioninquirer.com/wp-content/uploads/sites/38/2018/08/web1_38504379_10156553098764655_8525423002098073600_o.jpgErin Miller | Galion Inquirer Galion grad and artist Meg Frazier sits atop the bleachers in the gymnasium at Galion Middle School next to the mural she painted last weekend. Another mural is currently underway by Amanda Wiggins with funding for both projects provided by the Lighthouse Team.